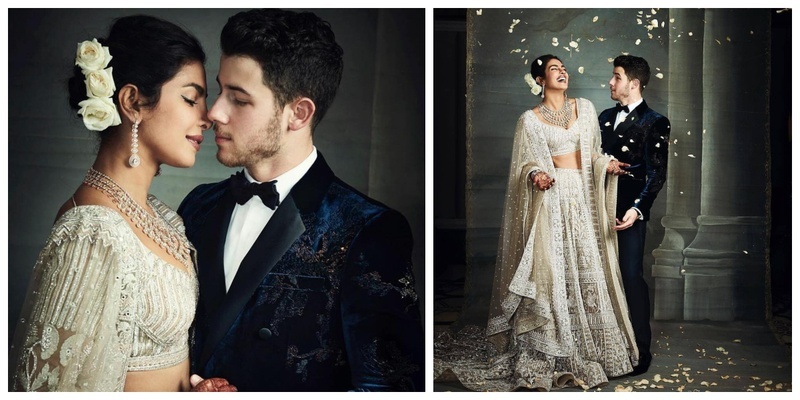 After getting hitched in two extravagant wedding ceremonies at Jodhpur's luxurious Umaid Bhawan Palace, Priyanka Chopra and the American singer Nick Jonas threw a lavish reception at the Taj Palace in Delhi and it sure was an affair to remember. The power couple looked stunning as they arrived hand-in-hand at the venue and we literally can’t get over how stunning they looked! Priyanka was a vision in a champagne-hued Falguni Shane Peacock lehenga. She completed the look with a layered diamond necklace and earring set paired with choodas, minimal makeup and white roses in her bun! Nick on the other hand looked dapper in blue velvet suit. The perfect Jonas-Chopra family picture right? While Priyanka's mom Madhu Chopra looked gorgeous in a gold silk sari, Nick's mom Denise Miller Jonas looked every bit elegant in a peach-gold lehenga. Als0, I am literally going gaga over Joe Jonas, and his fiancee and Game of Thrones star Sophie Turner, who stunned in a Sabyasachi pastel lehenga paired with an elegant neck piece and mangtika! Sansa Stark in a lehenga people! PM Narendra Modi was among the high-profile guests at the wedding reception. He also went up the stage to wish the couple and then posed for a picture with them before being joined in by the Chopra and the Jonas families. Well well, with the Delhi reception like this, here’s awaiting for their big-fat Bollywood reception!